Met Phil's crew again this morning at Frontera; I actually got there a bit early and logged a bunch of stuff in the parking lot, including a very "in your face" Long-billed Thrasher and a Swainson's Thrush calling from the wood. It had apparently been awhile since I had been there, as I don't remember the path from the parking lot to the building being so green and lush! The water feature was rather quiet, though, and when Phil et al showed up, the only thing to come visit was a female Archilochus hummingbird. We made the rounds, and it was really quiet; a couple of Green Parakeets screeched overhead, but the most birds we saw were a group of Black-bellied Whistling Ducks standing on the boardwalk railing, soon to be joined by a Snowy Egret! Around the boardwalk area a Painted Bunting was singing, but we could never spot him while a Hooded Oriole called in the same area. Around the back side I did hear a Warbling Vireo sing, but we couldn't get him out, and a couple of Catbirds at the feeder area showed themselves to me but no one else... We saw the normal doves et al at the feeders, and when someone pushed the Chachalaca Button (as Phil says ☺), we decided it was time to head to Estero! From the gazebo we went straight back to Dowitcher Pond where we initially had more of the same (one phalarope was spinning on dry land, which we thought was pretty funny), but it was starting to drizzle pretty good and my bins were getting wet, so I was getting ready to retreat when Dan Jones walked up! 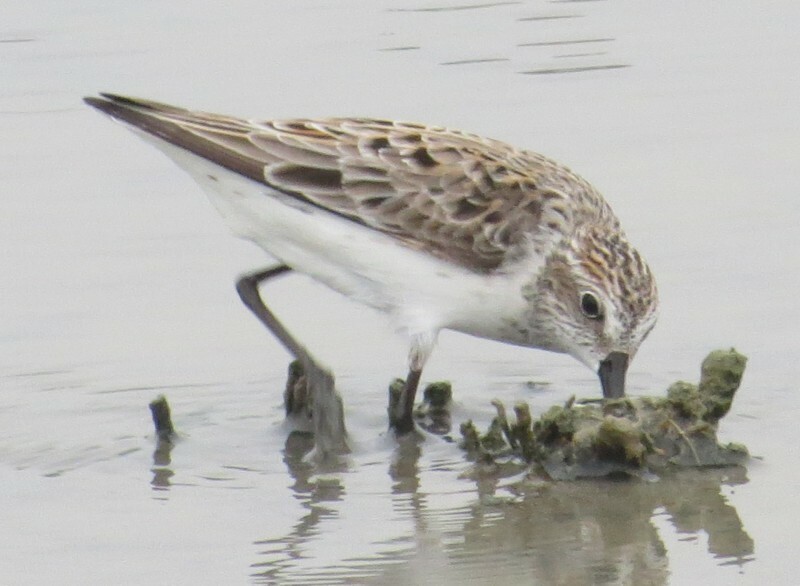 Thankfully he took a closer look at those distant peeps, so I cleaned my bins off real good and was able to see the White-rumped Sandpipers he had spotted! 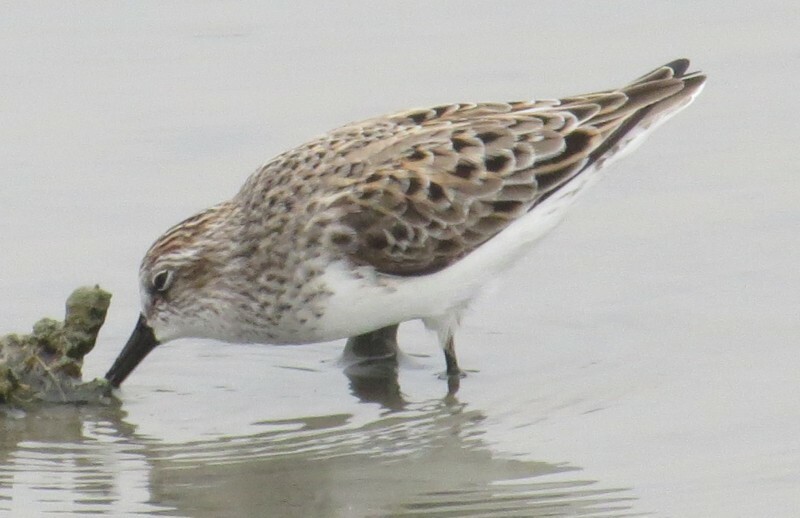 The San Diego gang definitely wanted those, and like at Port Aransas, we had a dull bird that looked very much like a Baird's until he lifted off! ☺ We also had a smaller peep closer to us that we settled on Semipalmated, but as Dan and I got to discussing the finer points of peep identification, I noticed that my charges had all drifted over to the bench, so I figured I'd better be a good hostess and thus took my leave of Dan... ☺ On the other side of the pond were Spoonbills and White Ibis, along with a late Shoveler, so those were nice additions! 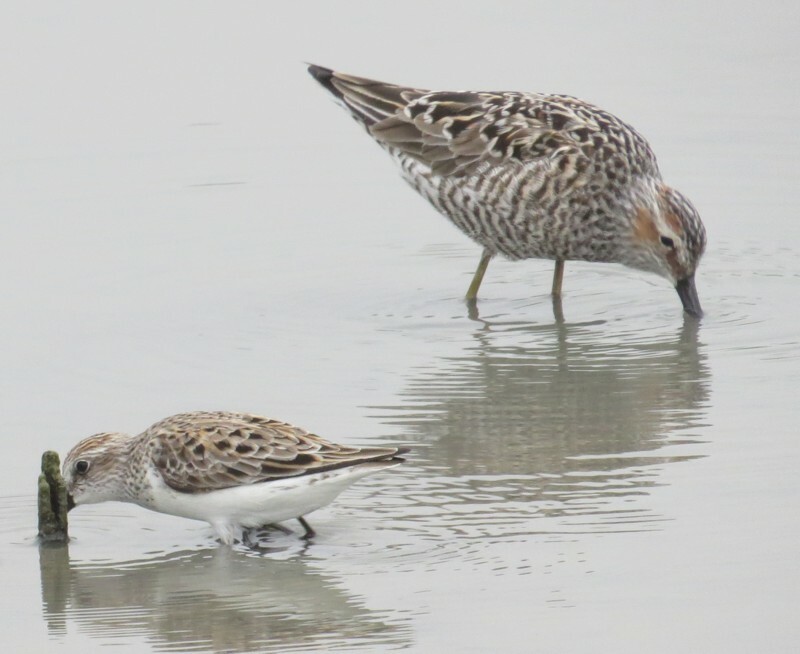 At Dowitcher Pond we had several types of sandpipers - here is a Stilt (above) and a Semipalmated (below). 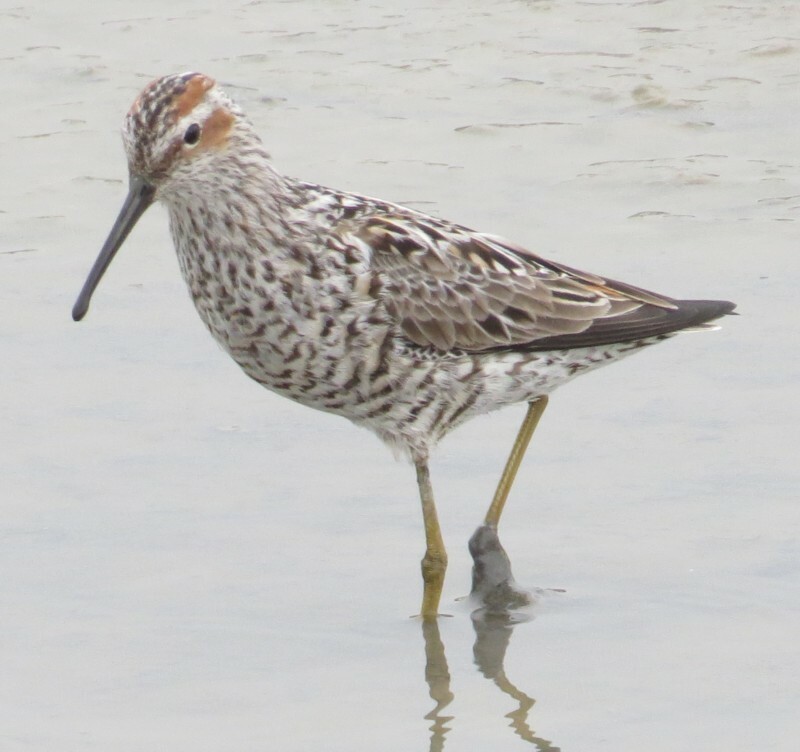 The Stilt Sandpiper in breeding plumage has a nice rusty ear patch and barred underparts. 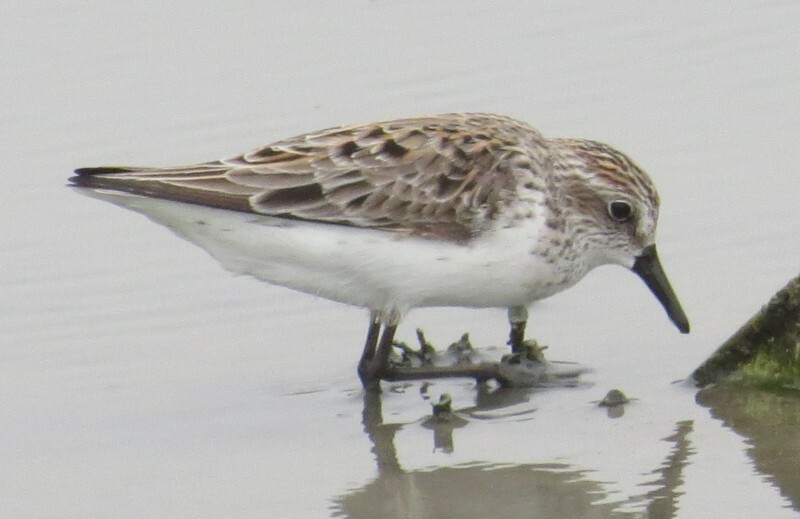 The Semipalmated Sandpiper can be quite striking as well! We were debating about continuing on to Alligator Lake, as Alligators were by no means guaranteed (Phil thought they had a better chance at the Island), nor were Anhingas (another target bird), so seeing my other friends from Virginia, Sam and Liz Williams and his crew, had reported that Huck had just filled the feeders in the Tropical Zone, we decided to head back there. On the way we had a nice immature Swainson's Hawk fly over, but I was beginning to think we shoulda gone to Alligator Lake as the TZ was very quiet as well (plus, that's where Sam et al had wandered off to). 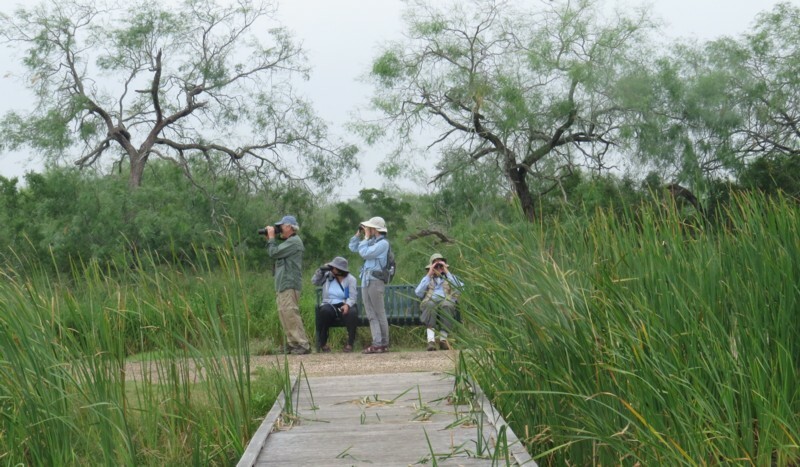 But we did take a second look at the owl box as Ranger John had suggested (we ran into him and his school group out in the grasslands), and he was there, sitting in his "door"! What a great look! We also had a nice Zebra Heliconian flop by along the walkway. 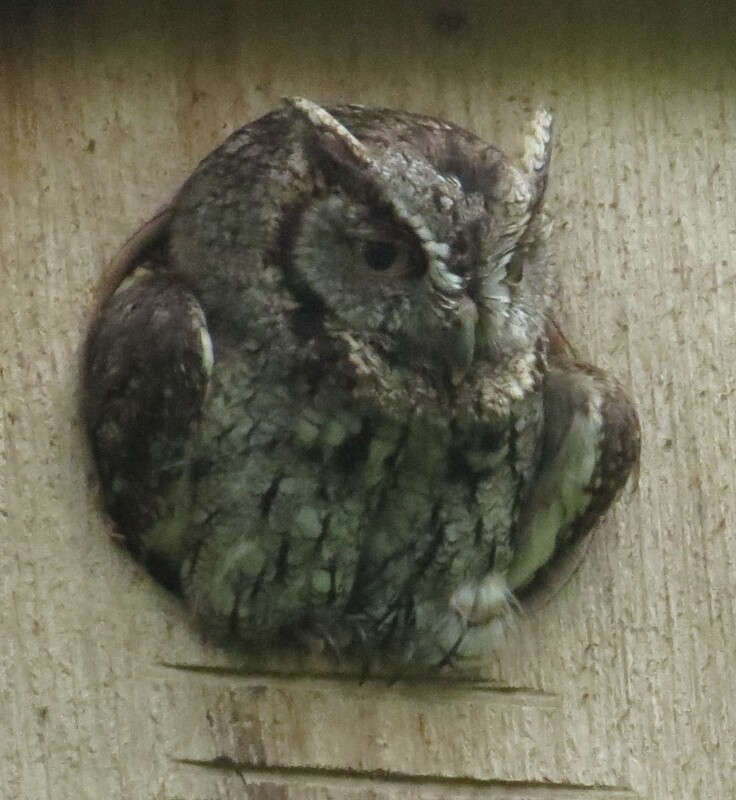 Eastern Screech Owl surveys his territory from his box! After lunch, the gang said they were interested in trying the Progresso Sod Farms in hope of some grasspipers, only when we got there, there was a big pile of dirt blocking the entrance due to road work! So I apologized profusely, and we went our separate ways, agreeing to meet on the Island tomorrow.